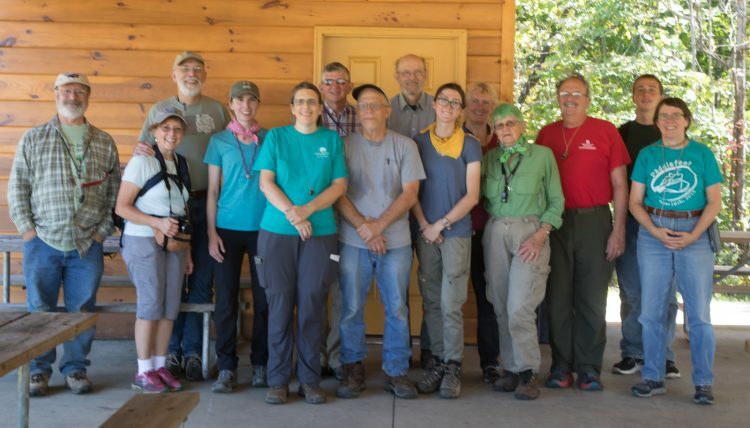 The 2017 OMLA Fall Foray was held in Morgan County, Ohio. Collection locations included Burr Oak State Park, Wildcat Hollow (part of Wayne National Forest), Ringgold Cemetery, and the farm of OMLA member Julie Tome. OMLA at Burr Oak State Park, Morgan County. The areas in which we collected (western and central Morgan County) offered habitats including mature and secondary deciduous forests, boulders and outcrops, streambeds, flood plains, and man-made substrates. Our scope room in the Burr Oak State Park Lodge included a beautiful view of the lake, and many of us stayed the weekend in the park, whether in the lodge, cabins, or campground. The “scope room” in the lodge is a moss and lichen laboratory. Lichens found during the Fall Foray totaled 119; 63 macrolichen species and 56 crustose species. Microscopic examination also revealed 2 species of lichenicolous fungi. 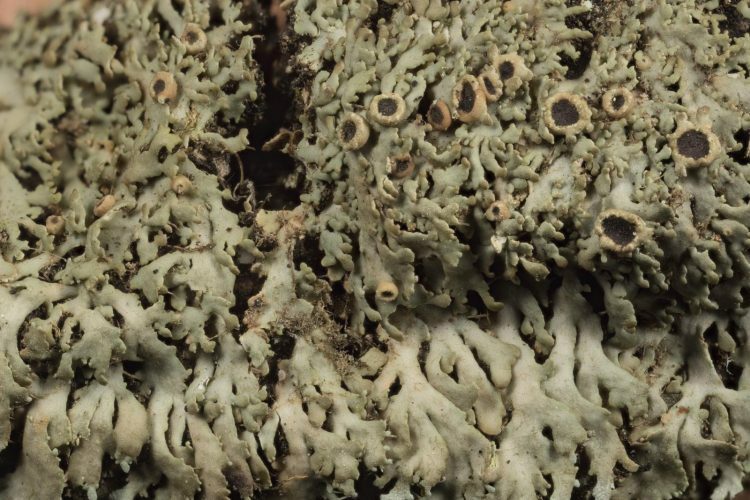 These fungi which are parasitic upon lichens are sometimes included in a comprehensive lichen list. 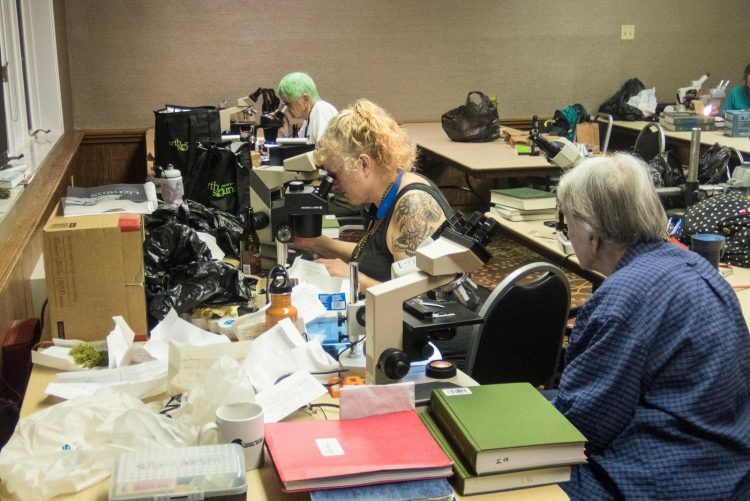 Most of the macrolichens observed had already been reported for Morgan County but 16 were new county records, bringing the county total to 83. The distribution of crust lichens in Ohio is only now being studied, so the crustose species are not noted as new. Fringed lichen, Anaptychia palmulata, seen at the base on an oak tree at Burr Oak State Park. Harvey Miller, which shows no records for Morgan County. So the 9 species found during the Fall Foray might all be considered new county records. 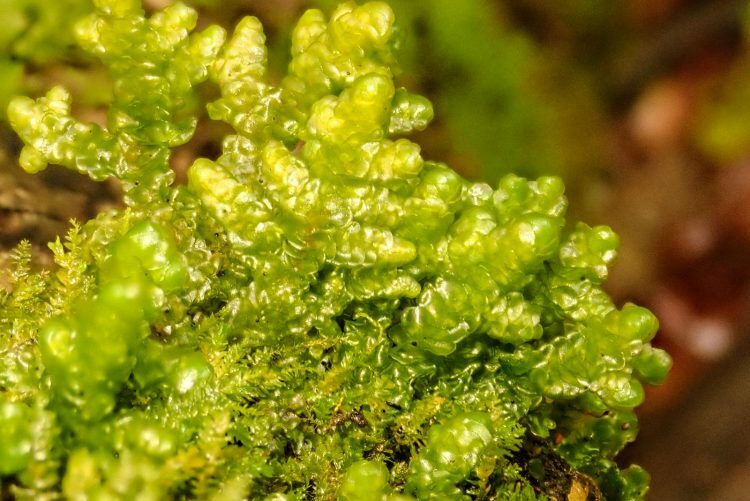 Porella platyphylloidea is a leafy liverwort found on trees. 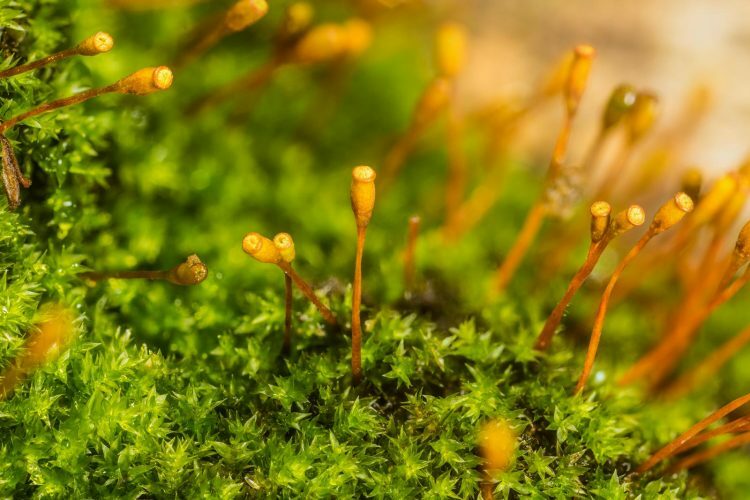 Anacamptodon splachnoides is “knothole moss,” seen at eye level on an oak tree.